The Football Association has begun an investigation into allegations made by Chelsea against referee Mark Clattenburg following Manchester United's 3-2 win at Stamford Bridge. Chelsea have made a formal complaint against Clattenburg, accusing him of using "inappropriate language" towards two of their players on Sunday. Part of the allegation is that Clattenburg used racial language. Police say they are considering a complaint made to them. Clattenburg has not been picked to officiate at a match this weekend. A statement from referees' body the Professional Game Match Officials board read: "PGMO believe that with any football match the focus should not be on the officials but on the players and the game itself. "Mark Clattenburg is one of the elite referees in world football and, in these circumstances, the intense level of scrutiny would detract from the match and be unfair to the clubs and the supporters of both sides." "Whether handing out red cards or promoting hair-restoring products, Clattenburg has been no stranger to the limelight since taking charge of his first Football League game as a 25-year-old in 2000." The FA issued a statement on Monday confirming it has launched an investigation, adding it will make "no further comment at this time". 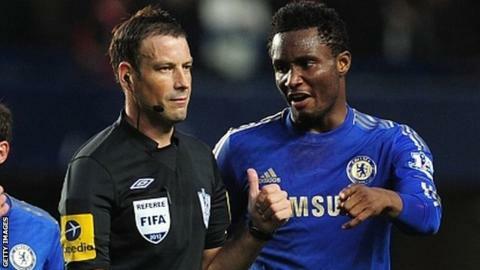 It is understood Chelsea midfielder John Mikel Obi is involved in the complaint. Peter Herbert, the lawyer behind the potential black players' breakaway union, has made a written complaint to the Metropolitan Police Service (MPS) regarding the matter. "Our information is that racist remarks were directed at John Mikel Obi and at Juan Mata. If so, that is wholly unacceptable in any circumstances," wrote Herbert. "Although this matter may be investigated by the FA, it is appropriate that the MPS independently see if a racially aggravated offence has occurred." In a statement, the Metropolitan Police confirmed they had received a complaint that was now being considered. "Officers from Hammersmith & Fulham borough have been in contact with Chelsea Football Club today (29 October), regarding the widely reported club referral of the referee's behaviour to the Football Association," added the MPS statement. "At this time, the Metropolitan Police has not received any complaint from either Chelsea Football Club or the Football Association. "We will work in partnership with Chelsea Football Club and the Football Association in order to consider any allegation that is made in relation to the reported events." When Chelsea confirmed they would be making a complaint on Sunday, PGMO issued a statement confirming Clattenburg would co-operate with any investigation. "PGMO is aware of the allegations and they are being treated with the utmost seriousness," the statement read. "Mark will co-operate fully and welcomes the opportunity for the facts to be established." Durham-born Clattenburg, 37, is on the Fifa list and refereed the League Cup final in February and the Olympic final between Brazil and Mexico in August. Former Premier League official Graham Poll has suggested Chelsea's complaint could hinge on evidence from Clattenburg's assistants and the fourth official. Linesmen Michael McDonough and Simon Long and fourth official Michael Jones may have heard conversations between Clattenburg and the players because all four officials wear microphones and ear pieces that allow them to hear what each other is saying during the game. "A referee's microphone is on open. Everything he says is heard by [his or her] assistants," Poll told BBC Radio 5 live. "So if Mark said something, the assistants would have heard it." The Metropolitan Police have also revealed that an investigation has been launched into an incident in which a steward was injured at Stamford Bridge as Javier Hernandez celebrated United's winning goal in the 75th minute. During the controversial encounter, Clattenburg sent off two Chelsea players. Branislav Ivanovic and Fernando Torres were shown red cards in the space of five minutes, with the latter's second yellow card for diving disputed by the Blues.